Recently, Moc Chau (Mộc Châu), Son La (Sơn La) has become a popular tourist destination not only for its beautiful scenery, majestic landscapes, mild climate but also for its favorable geographic location. People in the capital and neighboring provinces can visit Moc Chau and return within a day, or just spend their two-day weekend to get a satisfied relaxation. Places in Moc Chau that attract most people to visit and take photos are the green tea hills, especially the heart-shaped ones. 1. What Is The Attraction? The heart-shaped green tea hills are artificial products created by the skillful hands of the highland people. They are the symbol of vitality and love, bringing an unforgettable impression to visitors. In Moc Chau, there are various heart-shaped green tea hills to explore, in which Dai Loan hill (đồi chè Đài Loan), Tan Lap 3 hill (đồi chè Tân Lập 3), and Moc Suong hill (đồi chè Mộc Sương) are the three most famous. One must-do thing when visiting Moc Chau’s green tea hills is to dress gorgeously and take thousands of photos anywhere you like. The hills are immense, very open and spacious, making every photo full of green, freshness, as well as romance due to the distinctive shape, and you will easily find yourself a pleasing background to capture. Peculiarly, many young girls even hire traditional Hmong costumes to have the best moments with the surroundings. These hills are also where lots of couples choose for wedding photography. 2. How To Get To Moc Chau? From Hanoi (Hà Nội), you can choose to drive or take a coach to get to Moc Chau. If you drive yourself, first you need to go along Thang Long Highway (Đại lộ Thăng Long), then go on the route of National Highway 6 (Quốc lộ 6). When you reach to Van Ho crossing point, turn into National Highway 43 (Quốc lộ 43) and keep driving for 23 more kilometers, in the end, you will see the signboard of Moc Chau. On the off chance that you do not have a usable vehicle, you can catch a Ha Noi – Son La coach (xe khách Hà Nội – Sơn La) at any large-scale bus station, such as Giap Bat, My Dinh, and Yen Nghia station (bến xe Giáp Bát, Mỹ Đình, Yên Nghĩa). 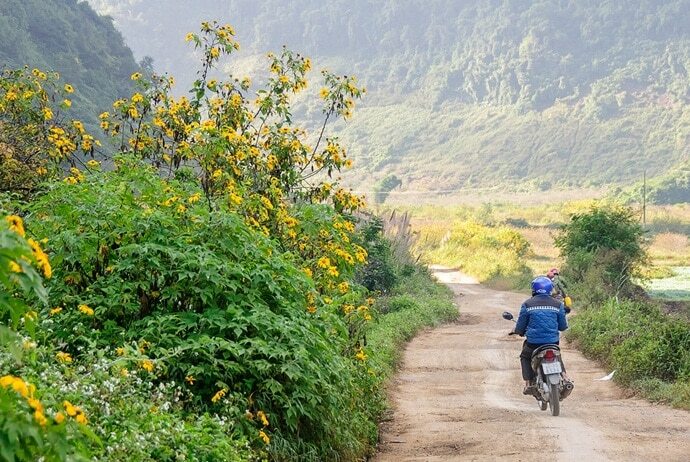 After being at Moc Chau, you should hire motorbikes for convenient transportation. 3. When To Visit Moc Chau? 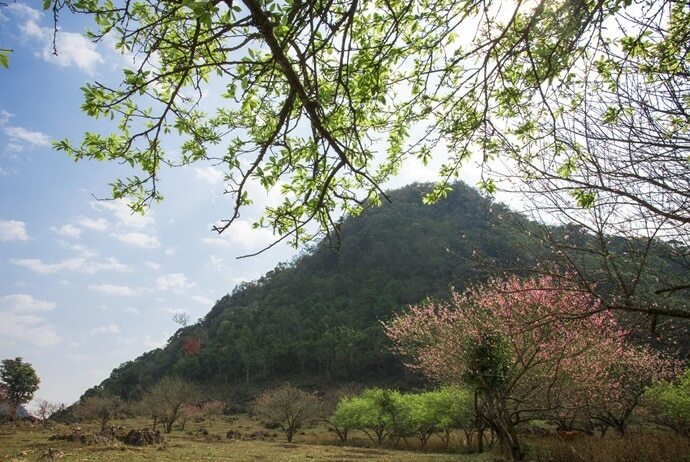 You can visit Moc Chau at any time of the year, as in each season, Moc Chau has its own beauty. However, the most appropriate time to fully enjoy the purity of green tea is the summer. From the early April to the late June, Moc Chau is like a lively picture, with not only green tea hills bringing on the color of vitality but also with gardens of plentiful ripe plums and peaches. Contemplating the dawn and sunset on the hills will certainly be wonderful experiences. 4. Where To Stay And What To Eat In Moc Chau? Moc Chau possesses two towns that are Moc Chau town (thị trấn Mộc Châu) and Moc Chau Farm town (thị trấn Nông trường Mộc Châu), both of which have various quality hotels. If you go to Moc Chau on weekends or public holidays, you should call in advance to make sure not to be embarrassed when you are in Moc Chau but cannot find an accommodation. Besides, along with the homestay needs of travel lovers, Moc Chau gradually catches up with the trend with numerous homestays built to serve the demand of a cheap-but-lovely resting place. Moc Chau in particular and Son La in general has an abundant cuisine with unique dishes. 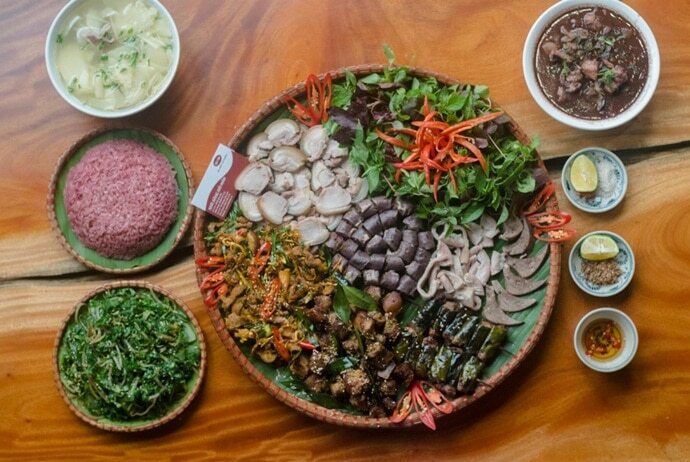 Moc Chau is well-known for its cattle farms, therefore, it cannot help mentioning dishes made from cows and calves, such as stir-fried calf meat, grilled beef with “mac khen” (mắc khén) – a special spice of the Thai people, cow’s milk, milk scum, and yogurt. In addition, freshwater fish and salmon, smoked buffalo meat, or taro soup are also dishes that you should not miss. Do not hesitate but come to Moc Chau to discover one of the largest and most beautiful highlands in the north, dip into the aroma of green tea in the sunshine, and watch the clusters of white clouds drift slowly. At that point, your soul will become more gentle and comfortable, and your tiredness will disappear little by little. If you have any questions related to tourism in Moc Chau, or if you want to share with us the story of your trip, leave a comment in the box below. For more information about other places to visit in Vietnam, please go to our home page.